Located in the city of Tacoma, Washington, Rex Pegg Fabrics has been serving the upholstery industry for over 55 years. Our 35,000 square foot warehouse is packed to the rafters with a huge variety of vinyl, fabrics, hardware, tools, foam rubber, and related supplies. On top of our selection and excellent prices, Rex Pegg Fabrics provides some of the best customer service you'll find anywhere. Rex Pegg Fabrics has been serving the upholstery industry for over 55 years. 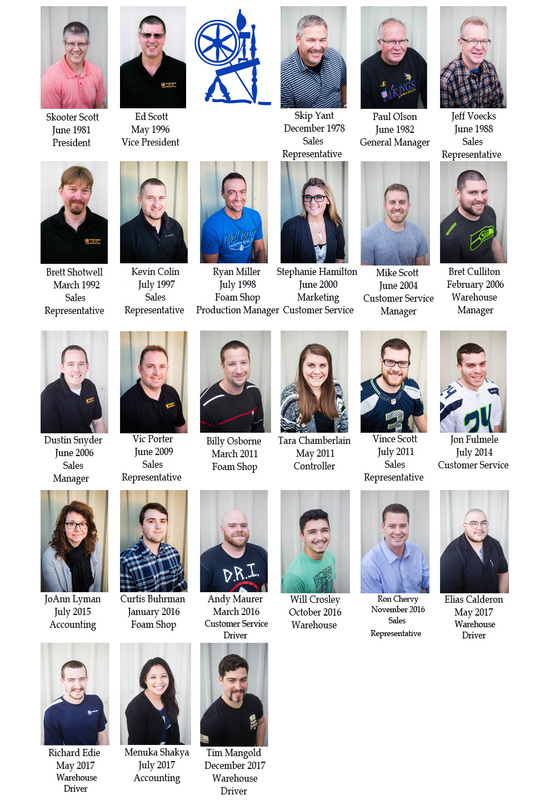 Our Team provides some of the best customer service you’ll find anywhere. Rex Pegg Fabrics was originally founded in 1962 by Rex V. Pegg. Rex started out selling automotive original fabrics and vinyl seconds. He would call on trim shops and sell out of the back of his station wagon. Rex hired Donovan Scott in 1970 as a salesman, as the company grew Don bought the company from Rex in 1982 located the company into the building where we are today. We pride ourselves on our huge variety of vinyl, fabrics, hardware, tools, foam rubber, and other related supplies that we keep in stock ready to ship out the same day you place your order. We understand the importance of time and we make sure we get your product to you fast and efficiently. Our team is very knowledgeable and ready to help with any product questions or assist with troubleshooting problems that may come up on your job. Now employing over 30 people (11 of them with Rex Pegg for over 15 years) Rex Pegg still operates as a family business, with Don’s two sons, Skooter and Ed, now owners. The Rex Pegg Team is constantly striving for excellence by making sure we consistently meet your expectations for quality products combined with fast and friendly service.